There is no shortage of notable jazz musicians called Peter King. Even if we limit ourselves to the ones who play the saxophone, we have at least three: the late tenorist who was born in London and co-founded Ronnie Scott’s; the alto player who was born in Kingston Surrey and is still wowing audiences today; and the subject of this review. This Peter King is an Afrobeat and highlife star who plays tenor sax, double bass and drums and was born in Enugu, Nigeria. He got his first break in that country with local hero Roy Chicago before relocating to England in the early 1960s. Here King studied at the Guildhall and backed visiting Motown acts like Diana Ross and the Temptations. He later attended Berklee College in the States before returning to Europe where he played with Sonny Rollins, Art Blakey, and Rahsaan Roland Kirk. Writing music for British television allowed him to bankroll this album, which was recorded in Camden in 1974. Astonishingly, it remained unreleased until the early part of this century when it briefly surfaced before vanishing again. Now, thanks to the Mr Bongo record label and their splendid “Classic African Recordings” revival series this lost treasure is available once more, and on an excellent vinyl pressing, too. 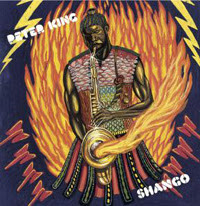 The title Shango refers to the Yoruba deity of thunder, lightning and fire — which explains the incendiary cover art. (Shango, or Sàngó, is sometimes spelled Django — but let’s not get into a Quentin Tarrantino diversion here). The album is riveting and hard hitting and it’s no exaggeration to call it a classic. Why it took so long to be released is a mystery — and not the only one surrounding this outstanding work. It opens with something resembling a Sun Ra chant before settling into a 70s funk groove. The diversity of music on offer here, and its integration, is startling and impressive. The wonderfully titled ‘Mr Lonely Wolf’ offers luscious fat guitar licks (Arthur Simon) alternating with stabbing sax (Humphrey Okoh-Turner plays alto on the album) and sweet floating flute from Peter King himself. It’s a track which manages, by turns, to be haunting and soulful, harsh and lyrical, while always maintaining a pulsing forward beat. And that’s some fine tambourine — not a phrase you’ll often hear me use. Elsewhere ‘Now I’m a Man’ draws all the strands together in a brooding groove, ‘Go Go’s Feast’ has a swaggering urban assertiveness which calls to mind James Brown and ‘Mystery Tour’ evokes Zappa while also featuring some fine, bubbling synthesiser which could honourably be interpolated into Steely Dan’s Royal Scam. In fact, the keyboard playing throughout this album is of a strikingly high standard, perhaps reaching a psychedelic peak on Watusi where it suggests Return to Forever-era Chick Corea. Yet while the cover notes name the above mentioned musicians plus David Williams on bass, Paul Edoh on congas, James Menin on drums and Mike Falana on trumpet, the keyboard player goes resolutely uncredited. This is the other mystery I mentioned. I can only speculate that it was someone so well known that they couldn’t be identified for contractual reasons. They sure as hell can play — as can everyone on this excellent album. Mr Bongo deserve congratulations for making this extraordinary music available again. I look forward to all their future releases. And the vinyl is a fine pressing, clean, dynamic and noise free. As with the other Mr Bongo releases, some sources still suggest it’s an 180gram LP which it certainly isn’t, being considerably lighter than that. But that’s irrelevant — there’s no sonic compromise here. And the music is exceptional. I suggest you check it out. It is available on CD, too, if you like that sort of thing. Oh yes, the vinyl release also comes with an MP3 download code — whatever that is.